Mayor William Stokes said the intent was to focus on safety code issues to make sure tenants live in safe conditions. The ordinance would also require buildings to meet all federal, state and local building and land use codes. 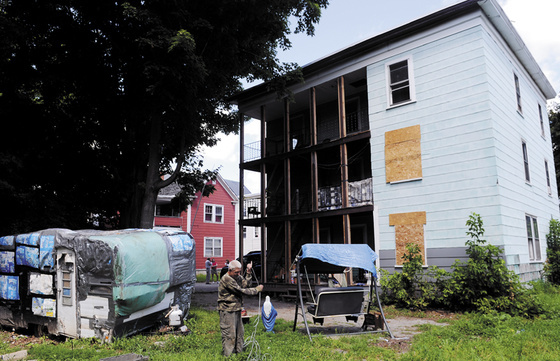 AUGUSTA — An attorney representing landlords warned that a proposal to require city safety inspections of apartment buildings rented to people receiving housing assistance from the city could go too far and push some landlords to abandon their buildings. Prompted by concerns that some low-income tenants in Augusta are living in substandard, unsafe apartment buildings, councilors Thursday discussed a proposed ordinance that would set standards and require inspections of any rental unit occupied by tenants who get General Assistance money from the city to help pay their rent. While Mayor William Stokes said the intent was to focus on safety code issues to make sure tenants live in safe conditions, the proposed ordinance draft, based on a Portland ordinance, also has language that would require landlords’ buildings to meet all federal, state and local building and land use codes. Brian Winchester, an attorney representing landlord members of the Capital Area Housing Association, said the current proposal is too broad. Stokes said it was also his understanding that the ordinance would focus on safety code issues, not general building or land-use regulations, and said the city staff would work to tweak the ordinance further and bring it back to councilors for more discussion over the next month and a half. Nancy Schiff-Slater, a 15-year staff attorney who represents low-income tenants for Pine Tree Legal Assistance, said the problems that would get landlords in trouble would be serious ones, including faulty wiring, inadequate fire escapes and infestations. She said the ordinance would help protect low-income people and noted it would be illegal for landlords not to rent to people receiving General Assistance. City Manager William Bridgeo said the city helps 100 to 120 low-income people a year pay for housing with General Assistance funds, which are partially reimbursed by the state. Bridgeo said some of the city’s housing stock is aging and deteriorating, and it is a problem that has gotten worse in recent years. The city has closed seven entire apartment buildings and one floor of an eighth building, totaling 42 units, in the last year because of safety code violations so severe that city officials ordered the tenants out. Councilor David Rollins said he’s heard from landlords who worry that the city could shut down their buildings for safety code violations even if they’re working to fix them. Bridgeo and Leif Dahlin, city services director, said in most cases the city works with landlords to address problems without forcing tenants to move out. They said the city orders buildings closed only when the safety issues are so severe people would be at risk of injury or death if they were allowed to remain in apartment buildings. Councilors noted the city has many fine, responsible landlords, but some allow tenants to live in unsafe, unsanitary units. Fire Chief Roger Audette has said even older apartment buildings need to meet the safety code. He said the biggest problems causing Augusta buildings to fall short of meeting safety codes tend to be inadequate fire escapes and doors and windows too small to provide tenants a second means of escaping from fires. He said building inspections would include inspections of the basement, not just the specific units being rented to tenants receiving housing assistance from the city, to make sure wiring and the furnace meet safety codes.